Pimpin' Aint Yeasty : Hood River Hops Fest: One of the best beer fests in the world??? Hood River Hops Fest: One of the best beer fests in the world??? Destination Hood River Hops Fest located in the beautiful Gorge, smack in between the epic Multnomah Falls (they are actually taller than Niagara Falls) and Mt Hood (Internationally famous for snowboarding all year round because there is a glacier at the top of its Timberline ski resort. Also home to the famous Timberline lodge where the horror movie The Shining was filmed). The fest hosted 42 craft breweries and 62 specialty beers on tap. Many of which were special limited brews made just for this event. Great company, 9 friends rented an amazing house (owned by local brewery owner of Everybody's Brewing) 10 minutes out of Hood River, right on the water, with fire pit in the front yard and fire place in the living room. 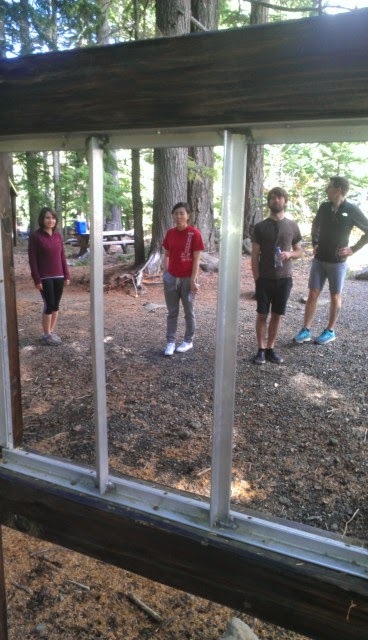 This pic is of some of us getting ready to hike pre-beer fest. This was the gold and the end of the hike-rainbow. Tamanawas Falls. Out of 62 beers I tasted 16 of them. Home town co-hosts Full Sail with their Fresh Hop Pale Ale. "Full malty body with biscuit & caramel flavors support hop notes of spice and citrus." I can't say I tasted the biscuit but I definitely caught the rest. This is what I love about northwest beers, complex but easy drinking, super hoppy but no bitter aftertaste. GoodLife Brewing - 150 Hippies. If you ever get offered a GoodLife, please don't pass it up. 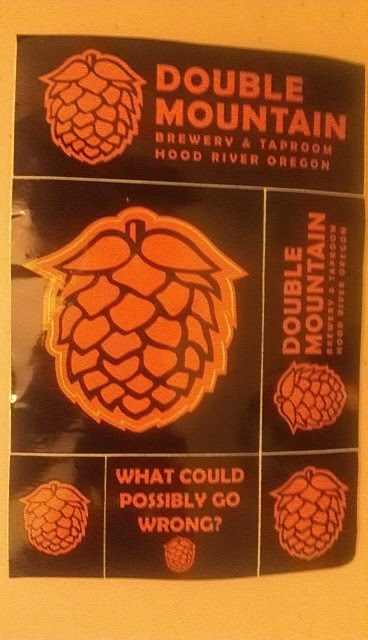 These Bend, Oregon hippies make some of the best beer in the area, and I'm talkin' about Earth. 150 lbs of of fresh hops from local farms and backyard enthusiasts went into 150 hippies, it tastes like love and peace. No contest this year. All 9 of us in my group, plus several other new intoxicated friends we made there all agreed, hands down, the other local Hood River co-hosts Double Mountain was the best brewery there. They brought 3 excellent beers to the festival, so which was the over-all best was a little more controversial. Morder Weizen possibly my first experience with a fresh hop wheat, was kind of a cross between a hef and an ipa. It was good, real good, but got over shadowed by the 2 stars of the festival that happened to share the same table. The Killer Red, a fresh hop IRA, yup, Indian Red Ale, with wild aromas of blood orange, pineapple and forest; but this is no fruity diva, its just a great brew that your significant other won't mind the smell of. Also claimed to taste like biscuits and caramel...this was my top choice of the fest but "biscuits are biscuits and I'm not sayin' scones" (Hannibal Buress voice). The Killer Red tasted like beer, damn good beer. Maybe when I find a beer that tastes like biscuits to me I can finally claim to be a true beer aficionado. The Killer Green, if it was a competition, and my crew was judging, would have taken home the trophy. This may be the most pretentious beer description I've ever read: "ripe cantaloup, currant, kind herb, (hold on kind herb, is this a thing? I thought kind herb was the kind you smoke...) and pine aromas supported by a dry, brioche malt body (this is where I'm like who's the wine geek that wrote this for them?) and a pleasantly lasting bitterness. Be green, drink green (I think that last line was the only one the brew master wrote himself). Overall synopsis: Visit Oregon before you die. If you already have but haven't seen the Gorge or Hood River definitely get there. The best time to go? All year around, winter if you ski or snowboard, any other season for great outdoor hiking, biking, wind surfing, kite boarding, kyaking, rafting, beer & wine. 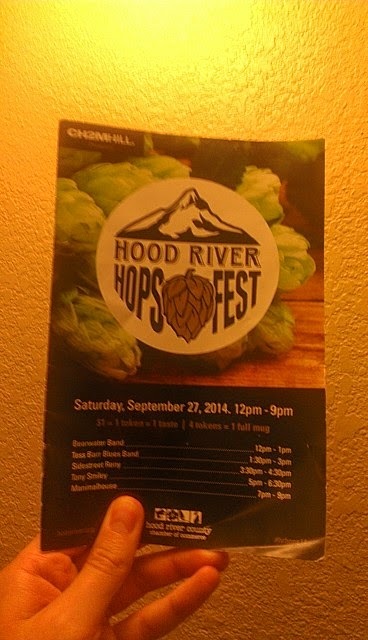 But late September for the Hood River Hops Fest, its a fresh hops and i.p.a. lovers dream.